With the National Park Service, we are pleased to present Eureka, artist Brian Tolle’s towering 40-foot-high sculpture of a 17th century Dutch canal house façade in Federal Hall’s Grand Rotunda. On view from June 27 – September 8, Eureka is part of a new curatorial initiative inviting contemporary artists to investigate themes that resonate with the history and legacy of the site. Originally created 20 years ago for Jan Hoet’s acclaimed Over the Edges exhibition in Ghent, Belgium, the sculpture’s re-presentation in Federal Hall blurs the site’s architectural and political history with the contemporary in Tolle’s conceptual artwork. Paying homage to the legacy of 40 years of Dutch rule in New York, for this presentation of Eureka, Tolle has chosen to exhibit his work alongside a rare viewing of The Flushing Remonstrance, the 1657 New Netherland petition for “liberty of conscience” that served as the precursor to religious freedom, as cemented in the First Amendment written at Federal Hall over a century later. Not seen in Manhattan in over 30 years, the Remonstrance (on view from Jun 27- Jul 2) will share a room with the Bible from President Washington’s 1789 inauguration at Federal Hall. Internationally renowned poet and activist Alexis De Veaux will lead a star-studded group of fellow writers and performers —Jericho Brown, Tina Chang and Aja Monet — in conversation at our inaugural Freedom Forums event on Tuesday, September 26 at 6:30 p.m. in Federal Hall’s Grand Rotunda. This year’s topic is Freedom: Personal, Artistic and Civic. With the audience, the poets will explore what freedom means in America today, even as basic democratic ideals and values are seemingly under siege. Freedom Forums is a multi-regional, multi-disciplinary series of events in New York City, the Adirondacks, Western New York and Long Island that use literature as a prompt to explore the ideas, ideals and contradictions of democracy. Learn more and reserve your place. We are partnering with the National Park Service and the San Francisco Art Institute to bring A Living Thing: Flag Exchange to Federal Hall for its first viewing in a ​public ​building beginning on September 6. 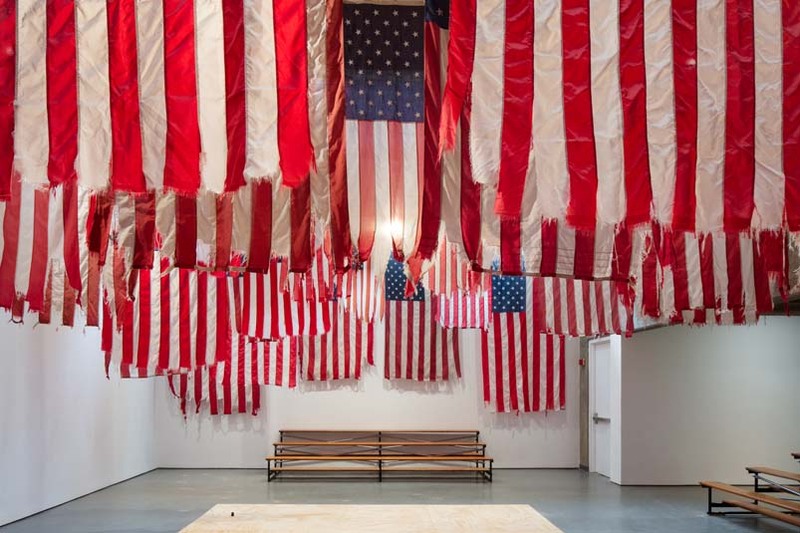 The exhibit, by conceptual artist and social interventionist Mel Ziegler, explores the production and experience of democracy, patriotism, and common ground. The installation, on view Monday through Saturday 9 a.m. to 5 p.m., will feature one flag from each state ranging in size from five-by-eight feet to 15-by-18 feet, spanning the Corinthian columns in Federal Hall’s Grand Rotunda, creating a space evocative of a town hall. Read the news release and see the exhibit page. We will award the First Federal Hall Medal for History during our annual Benefit Dinner on Thursday, September 28, at 6:30 p.m., in the Grand Rotunda at Federal Hall. The Medal is awarded to distinguished scholars who have helped to preserve Federal Hall as a hallowed site and unleash its potential. This year’s recipients include the Pulitzer Prize-winning historian/author Mike Wallace, who is the evening’s keynote speaker. Wallace’s co-authored opus, Gotham, is the first authoritative history of New York City. His new book, Greater Gotham, continues the saga. Other 2017 recipients of the Medal are, Charlene B. Bickford, Kenneth R. Bowling, Helen E. Veit and William C. diGiacomantonio — historian/editors of the First Federal Congress Project at George Washington University. 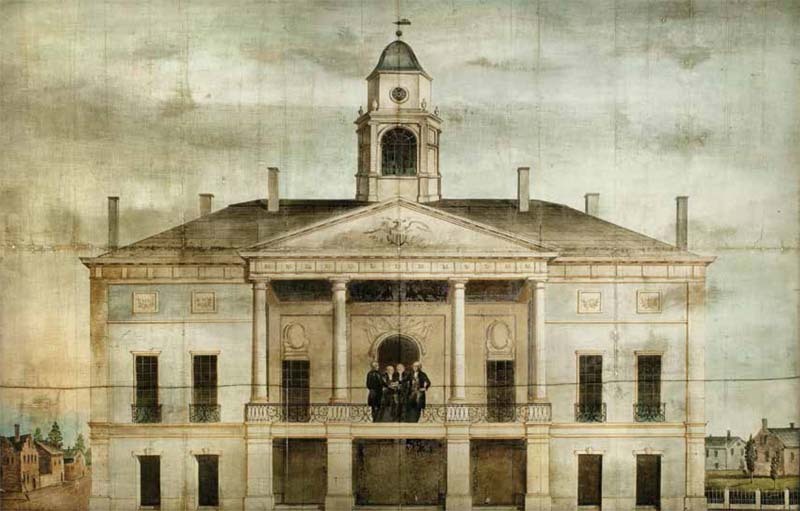 Their scholarship, through the 22-volume Documentary History of the First Federal Congress, greatly influences our plan for future programs at Federal Hall. Buy tickets online or by mail. Today, with the National Park Service, we announced the signing of a new agreement to manage the leasing of the site for private events. Under this agreement, Federal Hall’s landmarked Grand Rotunda and other spaces are now available for use by individuals and entities on weekdays and weekends after public hours. Revenue generated from this venture will contribute to our continued care and preservation of the landmark. For more information on leasing the site, contact Laura Herrera at 917-656-3748. See our rentals page for floorplans and photos and read the news release. We are excited to announce the relighting of Federal Hall’s grand rotunda dome using the latest in LED technology from Philips Color Kinetics. The project, made possible through a generous donation from Philips to our Harbor Conservancy, is a joint effort with the National Park Service to improve the quality of lighting in the majestic space and to increase the energy efficiency of the site. Federal Hall’s new Color Kinetics lights are the first for a national monument in New York City, however we join such icons as the Empire State Building on the cutting edge of lighting evolution. We recently completed with the National Park Service a study of the historic interior and a pilot restoration project of one of the building’s main galleries. The pilot project corrected decades of interventions, including removing stains and other unsightly discolorations from the marble as well as an accumulation of oil paint and spatters. The eight week process revealed the gallery’s prior use as office space through the ghosts of former partitions present on the newly bare piers and pilasters. These faded vertical and horizontal lines on the marble, marking the faces of former partition walls, can be attributed to interventions dating to the 19th century. These include the buildings first transformation in 1862 from a U.S. Custom House to a Sub-Treasury─ where steel-mesh partitions were installed─ and post Sub-Treasury in 1920, when several federal agencies were housed on-site. 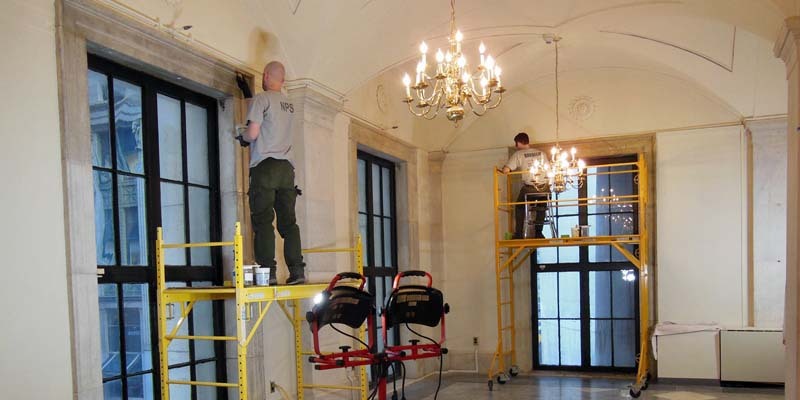 This project, made possible through a grant from the New York Community Trust to our Harbor Conservancy, also included a survey of the historic windows and other marble and glass elements and yielded recommendations for future restoration and maintenance. 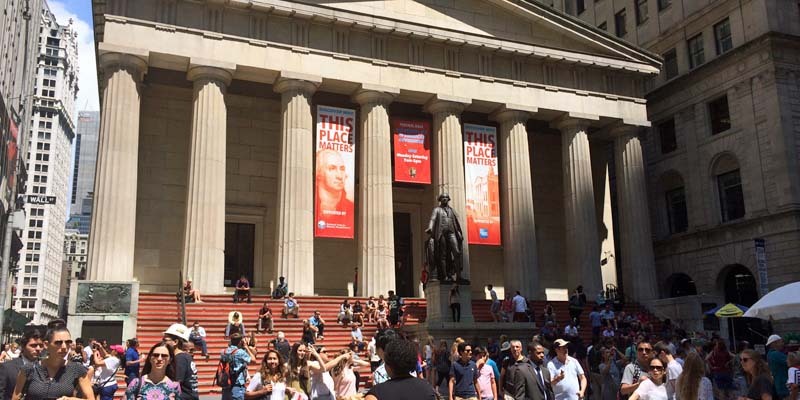 This Place Matters, a public awareness campaign by the National Trust for Historic Preservation and American Express, transformed Federal Hall’s Wall Street façade using large-scale graphics to celebrate the site’s history and significance. The effort is part of a year-long partnership with the National Park Service and our Harbor Conservancy, to increase visitation and awareness of the site which also includes development of new visitor materials. Watch the time-lapse video of the transformation (1 minute). 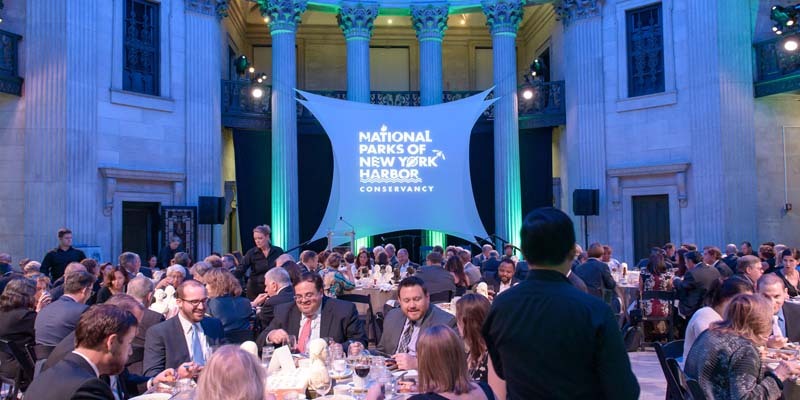 The National Trust for Historic Preservation today declared Federal Hall National Memorial a National Treasure and announced a new partnership with the National Park Service, our Harbor Conservancy and American Express to restore the iconic Wall Street steps. 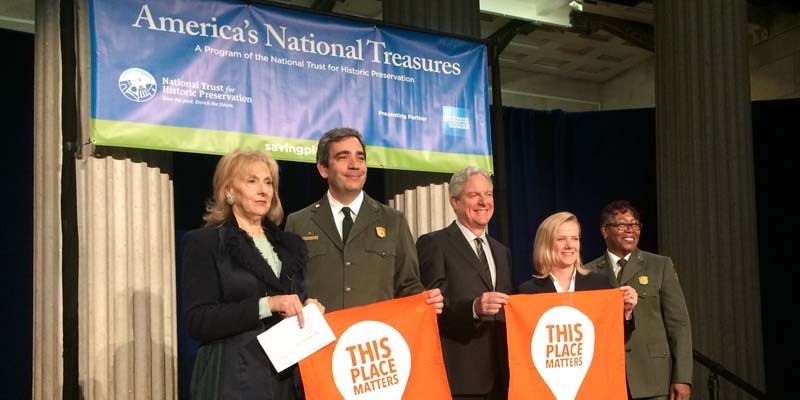 The day also marked the launch of This Place Matters, a public awareness campaign by the National Trust and American Express that encourages people to celebrate the places that are meaningful to them and to their communities. 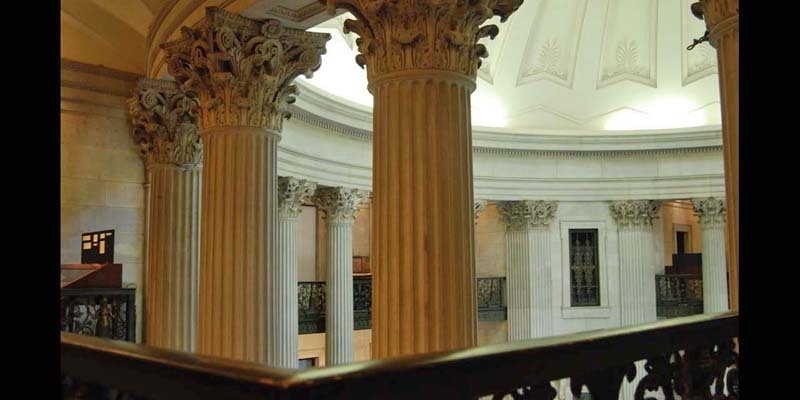 “Federal Hall matters to our history, our culture, our understanding of our country, and to the past, present and future of Wall Street,” said Stephanie K. Meeks, president and CEO, National Trust for Historic Preservation. Read The New York Times article or the news release.